The industry’s elite, including CEOs and SVPs of leading travel companies, government ministers and tourist board chiefs, attended the glittering gala event hailed as “The Oscars of the Travel Industry”. World Travel Awards celebrates its 20th Anniversary this year and is acknowledged across the globe as the ultimate travel accolade, celebrating those brands that are pushing the boundaries of industry excellence in product and service. Etihad Airways was one of the shining stars on the night, capturing Middle East's Leading Airline, Middle East's Leading Airline First Class, and Middle East's Leading Cabin Crew. Not to be outshone, Emirates took Middle East’s Leading Airline Business Class, Middle East’s Leading Airline Awards Programme and Middle East’s Leading Airline Website. Peter Baumgartner, Chief Commercial Officer, Etihad Airways and Graham Cooke, President & Founder, World Travel Awards. Other Award winners from across the G.C.C., saw the award for Middle East's Leading Business Travel Destination going to Doha, Qatar. Middle East's Leading Villa went to Jumeirah Zabeel Saray, Middle East's Leading Spa: The Talise Ottoman Spa at Jumeirah Zabeel Saray and the award for Middle East's Leading New Hotel went to JW Marriott Marquis, Dubai. 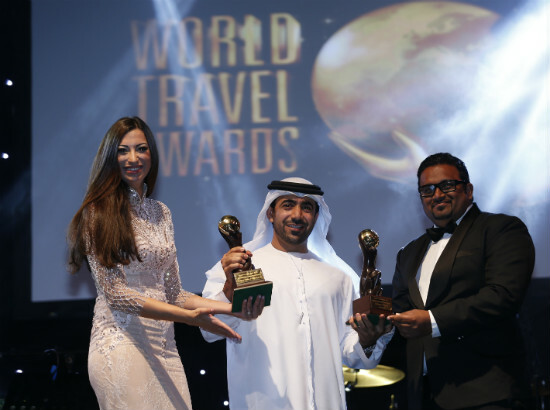 A bevy of awards were won by Atlantis, The Palm, Dubai for Dubai's Leading Resort, Dubai’s Leading Hotel Suite and Middle East's Leading Resort. Abu Dhabi’s continuing rise to tourism stardom was rewarded too, as it took home a host of top honours, including the award for the Middle East's Leading Exhibition & Convention Centre: Abu Dhabi National Exhibition Centre – ADNEC, the award for Middle East's Leading Tourist Board: Abu Dhabi Tourism & Culture Authority, Middle East's Leading Beach Destination: Saadiyat beach, Abu Dhabi, and Middle East's Leading Meetings & Conference Destination. Mubarak Al Nuaimi, Director of Promotions & Overseas Offices, Abu Dhabi Tourism & Culture Authority receives his award from host Shereen Mitwalli and guest presenter Mohammed Maleeh Jamal, Deputy Minister of Tourism, Arts and Culture, Maldives. W Hotel & Residences Qatar, La Cigale Qatar, Six Senses Zighy Bay Oman with Al Faisaliah Hotel, A Rosewood Hotel Saudi Arabia and Rosewood Corniche Saudi Arabia ensured the other nations in the region were well represented with awards. The Abu Dhabi Falcon Hospital was the recipient of Middle East’s Responsible Tourism Award. Visit www.worldtravelawards.com/winners for a full list of winners. WTA was launched in 1993 to acknowledge and recognise excellence in the global travel and tourism industry. Now celebrating its 20th anniversary, it is regarded as the highest achievement that a travel product could hope to receive. WTA’s global media partner network includes TV5Monde, CNBC Arabiya, Khaleej Times, Trade Arabia, TTN, ASTA Network, Breaking Travel News, Trav Talk, Travel Daily News International, Focus on Travel News, Vox Africa, New Focus Travel Magazine, Tourism Review, JAX FAX, Passport Magazine and Travel & Leisure China. This global media partner network has a monthly readership of 1.2 million and a TV audience reach of 90 million.